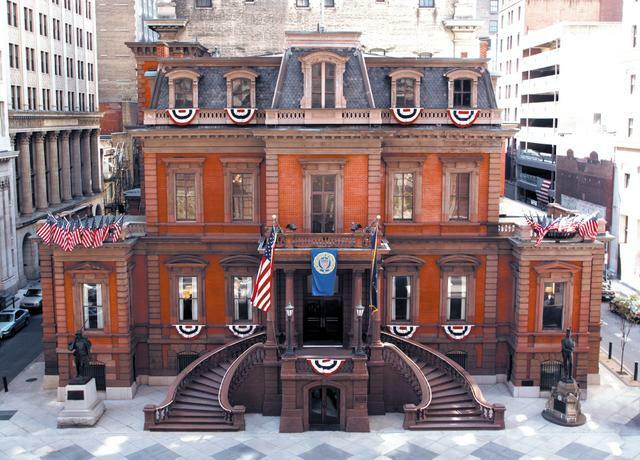 The historic, 145-year-old Union League of Philadelphia located on the Avenue of the Arts. A tidy and frail little old man asked me to direct him to the coat rack. To walk him around the corner from the long and elegant main corridor of the nearly 150-year-old Union League of Philadelphia was my first deed. If nothing else, it made for interesting conversation when I made it to the elaborate second-floor President’s Ballroom, featuring thirty foot ceilings, a spectacular chandelier and portraits of dour looking old white men. For an half-hour or so after 5:30 p.m., I handled a rum and coke and ambled about the pre-event cocktail reception of the Sunday Breakfast Club, a not-quite cloak-and-dagger, invitation-only private society for organization executives. Perhaps nearly 200 members and guests of the seven decades young group patronized the open bar, chatted and nibbled appetizers. I did the same, more than a handful of times being approached by some degree of interest in the 20-something with a broken brown belt with black shoes. No ma’am, I’m not lost. I’m on the panel to which you’re here to pay audience.